WAS it a strange ritual slaying by (Ancient man)? Was it a mass slaughter of animals for food? Or were the killings for purposes so arcane that modern man will never fathom them? In one of the most provocative anthropological findings in recent years, a team of researchers has discovered that (ancient man). . . killed 90 giant baboons at a butchering ground on the plains of Kenya. Dr. Pat Shipman, a Johns Hopkins University anthropologist who led the three-woman team of investigators, said in an interview that in terms of fossil records ”our data represent an odd and unique incident for which we have no real explanation. We know that hominids living around that time hunted antelopes, pigs, hippos and elephants.” But only at Olorgesailie is there concrete evidence that of a systematic killing and butchering of other baboons. Although the investigators have no real explanation for the baboon killings and point out that they may have taken place over a period of years or been an annual rite of passage, they have reason to believe that the slaughtering and butchering were done systematically and selectively. Of the 90 individual giant baboons found in the area, studies of their tooth wear showed that 76 were juveniles and l4 were young adults. The numbers of males and females were about equal. The article attempts to diffuse the idea of a flood: “rather than a catastrophic event such as a flood, which would have caused the death of baboons of all ages” of course this doesnt take into account the weight distribution during hydrodynamic sorting. The anthropologist noted that, like modern-day baboons, very young giant baboons probably stayed with their mothers for protection. The research team also found indications of systematic butchering of the baboon carcasses. Dr. Shipman pointed out that anthropologists knowhow ancient animal bones break up naturally when the animal is killed or eaten by another another animal or dies after a fall from a tree. All the baboon specimens were found to have their heads smashed. Other body bones were found to have been broken in parts of the body that would have been struck by the tools of hunters. Such findings are all indications of (struggle). about twice as large as present-day baboons. They are believed to have been able to attack larger animals and to have successfully defended themselves in most cases. 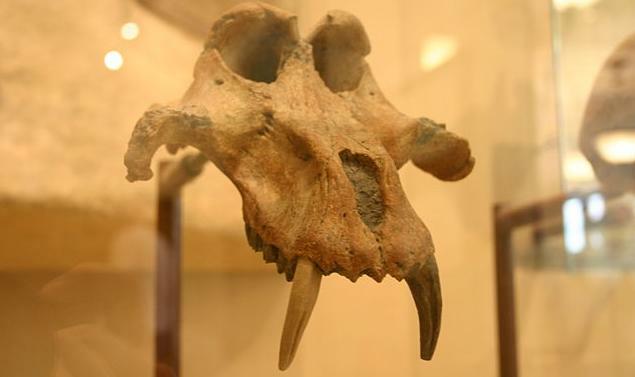 The giant baboon, Theropithecus oswaldi, was an old-world monkey . . .
For hominids to have successfully captured and killed the baboons required a heavy weapon. Such weapons – stone axes with blades a foot long -have been found near the butchering site, lending credence to the theory that the baboons’ skulls were crushed (by something). Although the team’s research provides no clues to how the baboons were captured and killed, Dr. Shipman noted that other researchers have observed present-day practises where baboons are rounded up and slaughtered for meat, marrow, sinews and skins by Africans in Tanzania. Dr. Shipman pointed out that giant baboons were so much bigger than the present-day species that they would have been much more fearsome animals. Dr. Shipman and her collaborators -Wendy Bosler, a research assistant at St. Thomas Hospital in London, and Karen Lee Davis, a doctoral candidate at the State University of New York at Binghamton – published their findings in the June issue of Current Anthropology. It seems like an incredible expense of energy to kill so many animals that we have every reason to believe were extremely dangerous. I have to wonder if the baboons, which I would guess traveled in troops then as now, died en masse in a flash-flood or lightning strike or similar catastrophe, or took ill all at once and were in a weakened state. Certainly such an opportunity would not be passed up by opportunistic hunters. To me it’s quite obvious! If you look at today’s Baboons they are one of the most hated animals by man. And if it was not for their size & numbers they would pose a much greater threat to any adjacent human settlements. So take things back to a time when we have less humans & bigger Baboons. I’m sure they would have.. until they decided they needed meat. And how many children will a human settlement tolerate them taking before they wiped them all out. I mean it’s not that puzzling if you apply it to behavior we see in the real world today. Baboons hunt small animals & share the meat in the troop. And it looks like they did this with a child, which we have seen happen in modern times. And the result is the same as what we have seen today.